YORK, Pa. (November 18, 2017) — Lincoln Speedway track champions were recognized and special year-end awards were handed out at the Wyndham Garden York Hotel Saturday night, November 18th. The top ten finishers in the season-long point series for both sprint car divisions were recognized and special awards were distributed in the annual awards banquet, which officially closed the 2017 racing season. Phoenixville’s Brian Montieth rode the strength of two wins and 15 top-ten finishes in 21 races to claim his sixth Lincoln track title. His second win of the season came on July 29th, continuing his climb to legendary status, when he came from 12th starting spot to win the non-stop feature. In true Montieth fashion, it included a thrilling three-car pass from fourth to first in one lap. Thirteen of those 15 top-ten finishes were actually top fives. Montieth is currently the winningest active driver at Lincoln. His sixth title is third to only Fred Rahmer (11) and Steve Smith (9). Montieth’s title also earned Scott Zellers Lincoln’s mechanic of-the-year award. 2014 and 2016 track champ Alan Krimes scored five top-five finishes and 12 top-ten finishes to stay close enough in points to take the season championship down to the final week and secure a runner-up finish. Montieth and Krimes have traded track titles the past five years, and Krimes has finished second in season points several times. It was quite a year for Dover’s Chad Trout, who was extremely consistent to finish third in season points. Despite losing popular car owner Jimmy Walker, who passed away during mid-season, Trout scored two top-five and 13 top-ten finishes to edge out Jim Siegel by a mere 20 points and Freddie Rahmer by 25 points at season’s end. Though Trout and Siegel both went winless on the season, 2017 Williams Grove champ Freddie Rahmer won twice. Sixth through tenth in season points were Cory Haas, Tim Glatfelter, Gerard McIntyre, Jr. (whose lone win came on April 8th), Glenndon Forsythe (who won on John Gleim Excavating Night July 15th and scored his first career All-Star win on August 19th), and Brandon Rahmer. 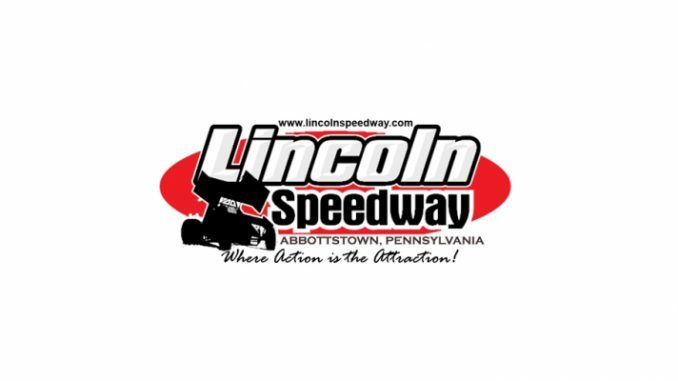 Lincoln’s winningest driver in 2017 was Danny Dietrich, who crossed under the checkers seven times, including the first two shows of the year, Weldon Sterner Memorial April 29th, National Fallen Firefighters Night June 10th, and Kevin Gobrecht Memorial Pennsylvania Speedweek show on July 1st. Despite missing a few shows to do some traveling, Dietrich still finished 11th in season points. First-time Lincoln winners during the 2017 season included David Gravel (World of Outlaw win on May 17th), Anthony Macri (June 3rd), and Kyle Larson (Pennsylvania Speedweek winner on July 3rd), who competed at Lincoln while leading the Monster Energy NASCAR point series at the time. Other Lincoln wins in 2017 were recorded by Lucas Wolfe (two wins) and single-race winners Lance Dewease (who claimed the $20,000 top prize in the “Dirt Classic”) and J.J. Grasso (who won the season finale). Anthony Macri was voted by track officials as the most improved driver for 2017, with Glenndon Forsythe awarded the annual Harry Fletcher Sportsmanship Award. Cole Young, who moved up to the 410 sprints from the 358s after a year off, received the rookie of-the-year award. All told, there were 11 different winners in 21 races at Lincoln in 2017. Despite not winning a race, Hallam’s Adrian Shaffer claimed his first track title in Lincoln’s 358 sprint car division. Shaffer was consistent throughout the year, leading the division with 14 top-ten finishes and eight top-fives in 17 races. An exciting season-long points chase would likely have gone down to the final week had Doug Hammaker not been injured in a post-race crash on the next-to-last event of the year, dropping him from a close second to sixth in the final points tally. Single race winner Brent Shearer finished second in season points, with five top-five and nine top-ten finishes. Third through fifth in season points were separated by only 30 points, with two of the drivers tied for fourth. Finished third was Todd Rittenhouse, Jr., with Matt Findley and Cody Fletcher tied in fourth. None of the three won a race in 2017. Doug Hammaker settled for sixth in season points. He was one of four drivers to win twice during the season. He was followed by Dalton Dietrich, Harry Fletcher Sportsmanship Award winner Phil Walter (a one time winner), and lady drivers Brie Hershey (a one-time winner) and Ashley Cappetta (voted the 358 sprint most improved driver of the year). Defending track champ Chandler Leiby missed a few weeks due to vacation and injury, did score one win during the year, and finished 11th in season points. Drivers who picked up their first Lincoln career wins in 2017 were Jordan Givler and Lincoln rookie of-the-year Steve Wilbur. Two-time winners included Chris Arnold (back-to-back wins in June), Jeff Halligan, and Todd Gracey. Other ’17 winners were Dwight Leppo, Kevin Nouse, and Chase Dietz (season finale). All told, there were 13 different winners in 17 events. It took 11 shows for Lincoln to see its first repeat winner in 2017.